Yeheey.biz is dead. As a result, thousands of members were left unpaid for their promised earnings. A few weeks ago, Joed Baron (left) and Erwin Borres Laraya (right) parted ways and built their respective companies. 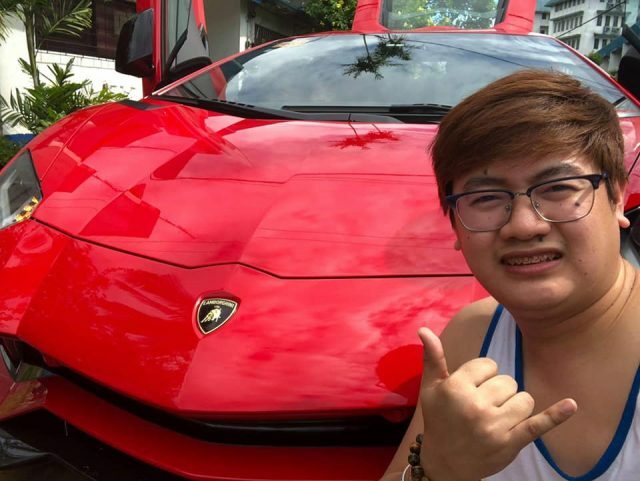 Baron and some other top earners are now busy running their new scam companies (Yeheey Biz Friends). At the same time, Laraya is busy promoting his Infinity Blessings. It hurts to revive the sad story, but we can learn a lot from this experience. Also, this article will give us a better understanding of our Yeheey Biz Friends review (coming soon). The founders and promoters say Yeheey (Yeheey.com) is an online business platform. They claim that it’s a combination of affiliate marketing, niche marketing, content marketing, and multi-level marketing. Yeheey iTraffic System, Inc. operated the said online business. Originally, Arjay Gallenero, (Paysbook Scam Founder), is the first CEO of the company. 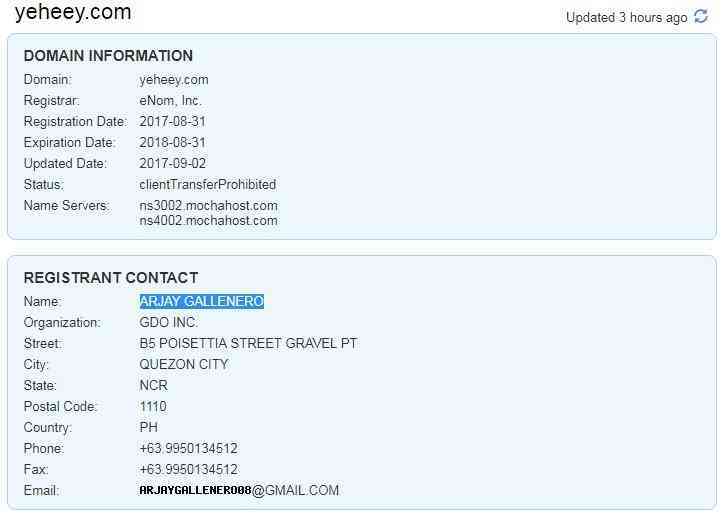 Gallenero registered Yeheey.com domain on the 31st of August 2017. Shown below is the screengrab from Whois.com for domain’s information. Call it coincidence, but the founders of Paysbook, Yeheey, and Pluggle are creative. If you examine their business model, you will find that they are all the same. In early 2018, it was rebranded and moved to a new domain (Yeheey.biz). Erwin Borres Larraya assumed as President and Joed Baron joined as Vice President. Video Tutorials about the business. Yeheey offers easy money to its members. Like Paysbook, PlanProMatrix, UnliFlex and Unity Wealth, the business promises unrealistic returns. To earn money, a person may or may not need to invite. Sign-up When someone sign-up to a sponsor’s link, he can earn 200 Yeheey points. Log-in and Log-out Bonus. A member gets 200 points per day whenever she logs in and logs out four times daily for six days. Donate and Win Promo. Points are donated to win various prizes. The company set the rewards at a particular time and whoever is the last clicker wins. Unli Survey. Fill out the survey per month and earn Php20,000. Unli-clicking Program. Earn Php4.00 for every four ad clicks per day. Sponsor Bonus. Get $2 for every recruit who signs up using the member’s link. Infinity Cycle Bonus. It’s a binary system. Every pair on the left and right side (including direct downlines) earns $2. Global Profit Shares. A Php50,000 earning is equivalent to one share of the company sales. Group Clicking Program. For every click of the members in sponsor’s group, he makes 0.50 Yeheey coins. First (1st) Cycle Bonus. A member earns $8 for every 1st cycle to each level of his group. Group Shares Bonus. A member earns from the total earnings of the team he belongs. According to one of its members, the company owed around Php34 million to its 10,000 affiliates. Baron, who now heads Yeheey Biz Friends, has promised to pay the balance. However, the time of payment is not known. The 10,000 affiliates earned the Php34 million from ad clicking with more than one account. When the enterprise can no longer afford to pay the amount, it banned multiple accounts from ad click program. The company officers announced that the practice violated their terms and conditions. Conversely, when the business was launched, members were encouraged to buy several memberships. During this time, the provision of banning multiple accounts using one device did not appear in the terms and condition. Did the officers miscalculate their earnings from ads? Did the advertisers pull out their ads due to fraud? The answer is irrelevant because paying people to click for ads is fraud. Indeed, the practice violated the advertising network’s policies. Sometime in July 2018, Yeheeybizfriends.com was launched. The new site is a social media platform of Yeheey. Also, on the 1st of July, the registration fee of the new account was increased to Php2,000.00. The old members must pay Php1,000 to avail of the additional ways of earning. 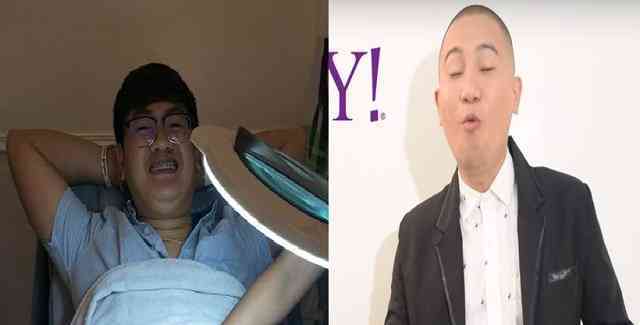 The public is hereby informed that while YEHEEY is registered with the Commission as a corporation, however, it is NOT authorized to solicit investments from the public as it has not secured the necessary license or permit from the Commission as required under Sections 8 and 12 of the Securities Regulation Code (SRC). Any offering to the public which involves an investment of money in a common enterprise with the expectation of profits primarily from the efforts of others constitutes an investment contract which is a form of securities that needs to be registered with the Commission. Promoters discourage an investor from cashing out his investment and encourages the rolling over of the investment and infusing more money. If you want the authorities to investigate the subject company, you must file a formal complaint. DTI handles Pyramid scams while SEC takes charge of unregistered investments. Atty. Howard Chan provides a procedure in filing a formal complaint. Check that out. Please share this article for public awareness. That is the only favor we’re asking from you.